With articulated, hight adjustable illuminatation. 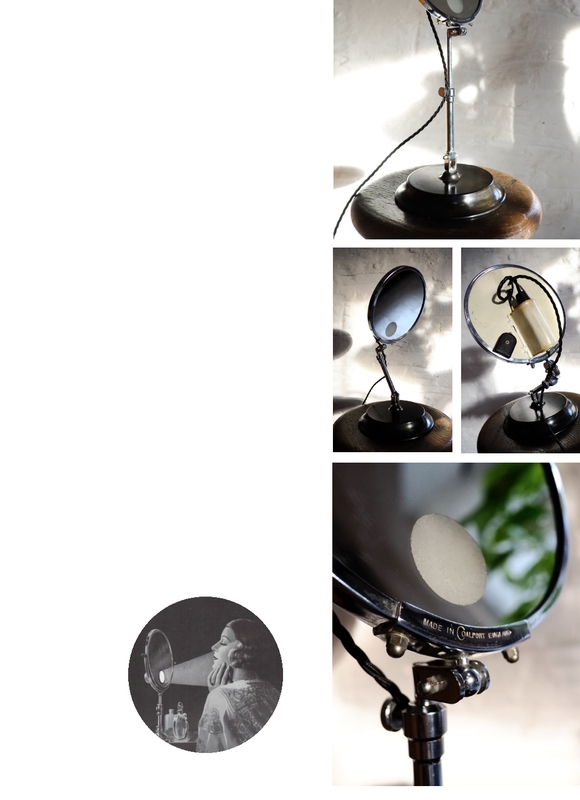 This circular, magnifying mirror is an ideal size for shaving or applying make up aided by perfect illumination. The mirror pivots at both the neck and base ball and socket joint. The chromed fixture is also height adjustable with screw adjustment at the mid point. Both the mirror and chrome plating are in excellent condition. A small bayonet lamp holder is positioned behind a frosted glass circular insert ensuring a soft, even light. The lamp has the added benefit of preventing the mirror fogging whilst illuminated. The mirror is mounted on a glossy bakelite plinth for stability. We have re-wired the lamp with black cloth covered flex, it is supplied PAT tested with a black vintage style plug. * This is an antique item and will not meet current regulations for use in wet areas such as bathrooms but ideal for dressing table use. CONDITION: Excellent, full working order.